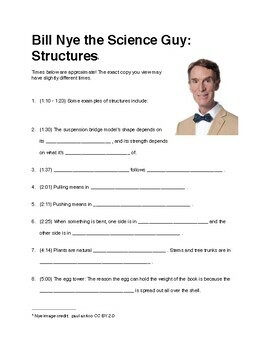 This worksheet goes with the Bill Nye video on structures and the forces o them. The worksheet can be filled out while playing the video and is best done by indiividual students or pairs on their own devices. This video can also be projected and used by a whole class. The latter approach may be preferable in situations where students have limited language ability, as the teacher will be able to pause the video and reinforce concepts and vocabulary.